I was waiting to pick up some books I had on hold at the library and there was a display table of featured YA books. 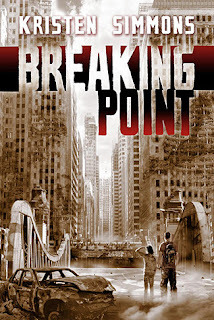 Breaking Point (Article 5, #2) by Kristen Simmons was on the table. It looked interesting, but I passed on it. However, I couldn't stop thinking about it so when I returned the books I had checked out I picked it up. However, it is book 2 and I didn't realize it until I was a ways through Breaking Point. I finished it and then went back to Article 5. I don't think it mattered much that I read them out of order. From the mix reviews that Article 5 has, it might be better that I read Breaking Point first. All the way through book 1 I was trying to figure out how they got to where they were in Breaking Point. 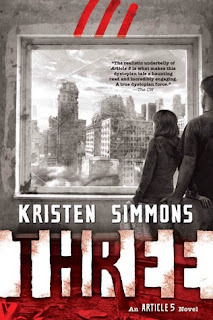 In Kristen Simmons's dystopian universe there has been major war in the US. Whether the enemy was from within or without is unclear. Most of the major cities have been destroyed and there's a new regime in office. In a lot of ways, the society seemed to me to be like Hilter-era politics. The Bill of Rights have been thrown out and in their place are the Moral Statues. Embers suburban town has for the most part been untouched. They are cut off from the rest of the country as news and television is under government control. The economy is in shambles and everyone is struggling, but as long as you keep the statues then you're okay. Or so she thinks. Unfortunately, the government is tightening its control and enacts Article 5 - it's a crime to have a child out of wedlock. And the Article is retroactive. 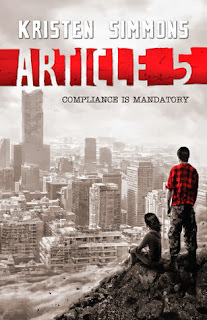 The Article 5 series is a bit of a Hunger Games wannabe, but not as well written. Book 1 was better written than book 2. It is young adult, but I thought there was way too much repetition. Particularly in Breaking Point - I thought I might scream if I had to read 'he killed my mother' one more time. Like I said, I had the need to know how they got to where they were in Breaking Point driving me while reading Article 5. And while I enjoyed Breaking Point in the beginning about halfway through I stopped caring. Mostly it was the repetition and the book just felt it was being dragged out. It is kind of funny (not in the ha ha way though) in both books they are trying to make it to the safe house. Simmons does a good job of making Ember a believable 17 year old. I had more trouble figuring out the age of Chase and some of the other guys. Even the repetitiveness of Ember's thoughts were understandable, if a bit tiresome. She has lived a relatively sheltered life up to the point when Federal Bureau of Reformation soldiers show up at her door on an Article 5 violation. So she is confused and trying to reconcile in her mind who the good guys and the bad guys are when it's pretty much every man for themselves. Overall, the series is decent. It moved a little too slowly for my liking. I would have liked to have seen more progress by the end of book 2, more answers to why the society has become what is has. Unlike in the Hunger Games, we have yet to see those that are in charge. Particularly in book 1, it seems to be a government of sadist, but all were are seeing are those the have been put into "leadership". The president is mentioned but it is more of an off handed comment, than insight into the regime. Breaking Point does thinly imply that the war may not be what the characters think it was. Book 3, aptly named Three, is due out in February 2014. While I'm not anxiously awaiting its release, if I see it when it comes out I'll probably pick it up. How Breaking Point ends gives some hope that we might get some answers, but it could also be more of the same. This series has perhaps the most variation in reviews of any book or series I've ever seen. Seriously, the reviews are all over the place. If you are trying to fill the void left by Hunger Games, you might want to pick up this series. It had some really good moments.